I’m an Associate Professor in Internet Studies at Curtin University, teaching into the Internet Communications major. 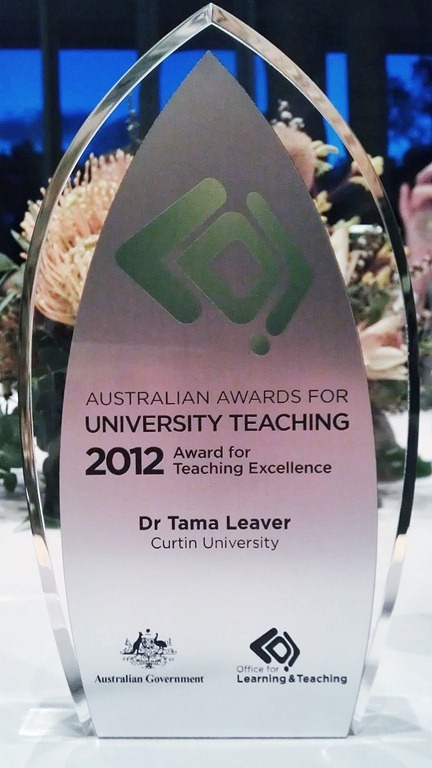 My educational approach has been recognised with teaching awards from the University of Western Australia, Curtin University and, in 2012, an Australian Awards for University Teaching Award for Teaching Excellence in the Humanities and Arts from the national Office of Learning and Teaching. I regularly taught Web Communications which is the flagship unit for the Internet Communications major from 2009-2014, and sporadically thereafter; it is taught in three parts, the first introduces the Internet and World Wide Web, the second looks at the emergence of “Web 2.0” (looking at blogs, wikis, Twitter, social networks and content sharing) and culminates in a critical examination of social media and individuals and/as information. The unit is also available at the graduate level and available online via Open Universities Australia running in all four study periods annually. In 2015 I wrote and ran Web Play: Online Games and Gamification, which explores the impact of videogames and game mechanics of various forms throughout contemporary society. This unit has since undergone various changes and is now taught as Online Games, Play and Gamification. Since 2016 I have returned to running my upper level unit Web Media which I first designed and ran in 2010. The unit explores the changing nature of the media landscape in light of convergence and digitisation. The first half of the unit explores the evolving nature of existing industries and media forms (television, film, music, photography and videogames) while the second half of the unit focuses on media forms which have emerged due to opportunities afforded by networked digital culture, including apps, online video, and spreadable media more broadly. Examples of the final Reflective Web Media projects completed by students in past versions of this unit are available online. The unit runs annually, is available at the graduate level and runs twice a year online via Open Universities Australia. Dr Karen Lowry, Metalepsis in Digital Poetry: Representing Australian Suburbia through the Convergence of the Verse Novel and Electronic Literature and Chamberlain Street, PhD 2016 (co-supervisor). Dr Erin Stark, “Re-placing the networked self: Place, identity, and the experience of being online” PhD 2015 (co-supervisor). Dr Salim Said Ali Al Kindi,”Online Tools in Teaching and Learning and the Problem of ‘Web 2.0’: A Case Study of an Information Studies Department, Oman“, PhD 2014 (primary supervisor). Dr Paul McLaughlan, “Beyond the Ebook: Digital Ecologies and the Future of the Author-Publisher Relationship, and Bibliotek: A Novel”, PhD 2014 (co-supervisor). Dr Deepti Ruth Azariah, “Mapping the Travel Blog: A Study of the Online Travel Narrative”, PhD, 2012, (co-supervisor). * Asterisked units were also taught offshore as part of the Communication Studies program at the Hong Kong University’s Centre for Degree Programmes).